New York: Signet, 1984. First Signet Printing 1984. (stated) cover art is cat's face showing fangs. [paperback] 4x7 inches. ISBN 0451132378. Clean pages. ** FLAWS: light spine creases. Light hinge crease on front cover. Minor edge and corner wear. Tiny corner crease. Else Very Good. Signet, 1984, 1984. 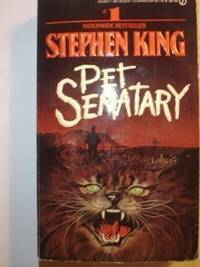 An ideal family is decimated by the death of their toddler son, finds out about an Indian sematary where buried pet return to life. The distraught father wants to bury their son their but is unaware of the deadly difference in those the cemetery returns to life. 410 pages first paperback edition 025. Paperback. Fine. New York: A Signet Book/Signet Books/Published by The New American Library, 1984. 1st Printing. Mass Market Paperback. Very Good. 12mo or 12° (Duodecimo): 6¾" x 7¾" tall. 410 pp. Solidly bound copy with minimal external wear, crisp pages and clean text. Creased spine. Light tear on back cover. Signet, 1984-11-01. paperback / softback. Mass Market Paperback. Good. Signet. Mass Market Paperback. 0451132378 . Fine. 1984-11-01. First Edition Paperb. Doubleday, 1975. A near fine hardcover with a good to very good dust jacket. Dust jacket has light edge wear and a stain on the spine. . Hard Cover. Near Fine/Good to Very Good. 1984-09-05. Good. Ships with Tracking Number! INTERNATIONAL WORLDWIDE Shipping available. May not contain Access Codes or Supplements. May be ex-library. Shipping & Handling by region. Buy with confidence, excellent customer service! Signet, 1984-11-01. Mass Market Paperback. Used:Good. Signet. MASS MARKET PAPERBACK. 0451132378 Like New Condition. . Fine. Signet. MASS MARKET PAPERBACK. 0451132378 New Condition. . New. 1984-09-05. New. Ships with Tracking Number! INTERNATIONAL WORLDWIDE Shipping available. Buy with confidence, excellent customer service!